IF you are still bummed by the endless 2011 winter and sunless spring, here's a way to put your blues away: Get out into a public garden. They weathered many tough months too, but they've recovered, are full of color and ready to charm. In mid-May, I toured Western Connecticut, visiting gardens of varying size, style and spirit. Here are five favorites. Wickham Park stretches over 250 rolling acres, with open fields, woodlands, ponds, picnic areas, an aviary and, seemingly, a garden for everyone's taste. In the Oriental Garden a gleaming white moon bridge serenely spans a pond lined with trees. Some flower, like Japanese snowballs, and some don't, like Japanese maples. As I strolled over the bridge, a lone white swan swam into view. Beyond the pond's end two brick pillars signal the entrance to a three-room English Garden. You can pick either the Lilac Walk (my choice) or the Cherry Walk to enter an evergreen maze surrounding a statue of Peter Pan, a lovely knot garden and a great lawn. Disappointingly, while there is a Hydrangea Corner and a Rose Walk, the English garden lacked the profusion of flowers and topiary one expects from an Eden modeled after the Hidcote Manor garden in England. Fortunately, many flowers lie down the road. An Italian Shrine, with two small religious statues, is lined with colorful annuals, and beyond that are rhododendrons. In the Lotus Garden bullfrogs croak, and a fountain jet spews from a pond, which for my visit was partly rimmed by purple and magenta azalea. A rare Usuzumi cherry tree, grown from cuttings from a 1,400-year-old tree said to have been planted by Japan's 26th emperor, Keitai, bloomed, pretty in pink. Atop a hill, the Sensory Garden features six rooms with flowers and fixtures (like wind chimes) chosen to illustrate the five senses as well as a sort of sixth sense, imagination. "Sight" offers a kaleidoscope of colorful blooms like hydrangea and roses, while "Touch" has soft, furry lamb's ear, prickly Golden Sword yucca and spiny Rosy Glow barberry. They are all well labeled, providing a beguiling learning place for children and adults. Elizabeth Park, in a stately West Hartford neighborhood, is most famous for its 2.5-acre rose garden. 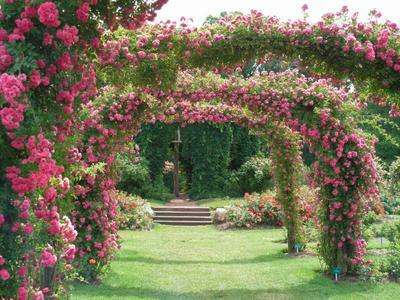 From a central gazebo, barely visible under Virginia creeper vines, eight archways covered in roses radiate like spokes on a wheel. They are flanked by hundreds of rectangular beds, and the garden is enclosed by rose-covered "fences." Dozens of varieties are planted to bloom in sequence — first the fences (mostly Harrison's yellow) and last the archways, which are mostly dark pink Excelsa and pink Dorothy Perkins roses. In between, the beds blossom with Queen Elizabeth, Knockout, Flower Girl, Baby Love, Betty Boop, on and on, about 800 varieties in many colors. The beds are labeled, and there is also a diagrammed list of the varieties available at the visitors center and a map posted at the garden's main entrance. At peak it's just gorgeous. Across the park road an annual garden was loaded with vivid yellow, red and cream tulips in a circular pattern; a perennial garden includes some 225 different plants, like Shasta daisy, Mt. Fuji phlox, Johnson's Blue geranium, Clara Curtiss chrysanthemum and peonies. I was lucky enough to catch the fragrant lilac collection in bloom (now finished for the season), and a little farther on there's a shady rock garden, with flowers like snow drops and day lilies, and juniper and cotoneaster plants. Just off scenic Connecticut Route 10 lies Hill-Stead, an estate whose one-acre formal sunken garden was designed by the celebrated landscape gardener Beatrix Farrand. Surrounded by a brick wall, it's an octagon built around a summer house. You should visit the summer house to consult a diagrammed key to the plantings and a laminated, illustrated guide to about 90 varieties of plants on view. Among the flowers in bloom on my visit were pansies, catmint, forget-me-nots, alyssum, myrtle and primrose — a sea of white and light blue, with dabs of red — as well as big Darwin tulips in pink and yellow, set among well-trimmed hedges. There's also a range of flowering trees, like pink crabapple and red flowering quince. Visitors can stroll trails through the estate's 152 acres of woodlands, lowlands and a wild garden, or take a guided tour of the 1901 house, designed by Theodate Pope Riddle, one of America's first female architects. The Bellamy-Ferriday House and Garden began life as a farm in the 1730s but was slowly converted into a Colonial Revival landscape with several gardens in the 20th century. The formal parterre garden — inspired by an Aubusson rug — has symmetrical flower beds planted with peonies and roses, interspersed with Virginia bluebells, Johnny-jump-ups and other perennials. A little glass table holds jars with clippings of what's in bloom. A list is available in the office. Allees of flowering shrubs — including quince, lilacs, viburnum and bayberry — form the parterre's north and south borders, and an arbor, for shrub roses and lilacs, serves as the entrance to a magnolia grove and the south lawn. The property, which includes an apple orchard, is surrounded by a walkway that takes visitors past flowering trees, like bottlebrush and dogwood, plenty of ferns, and — in spring — daffodils, grape hyacinth and the like. At Glebe House, a 1750 farmhouse restored in 1923, visitors can see the only survivor of three American gardens designed by Gertrude Jekyll, the renowned English designer who created more than 400 in her lifetime (1843-1932). Jekyll approached gardens as a painter might, striving for an overall effect. She favored drifts of color, a lush mix of flowers, leaves of many shapes and a variety of textures. But her gardens looked natural, not formal, with unexpected vistas and an occasional surprise. She planned this garden, about 600 linear feet of classic English mixed border design, in 1926, but it was not built until the late 1980s. Along Glebe House's northern perimeter, the theme is pink and white, with a few dashes of light blue, accomplished with varieties like Madonna lilies, peonies, irises and nigella. The east border simmers with hot colors, patches of red dahlias and minarda fading to rudbeckia and yellow foxglove. And the west border, which ranges from deep purple to pale blue, offers a sampling that includes forget-me-nots, sweet peas, globe thistle, and hosta. Jekyll framed her plantings with evergreen hedges. The house is ringed with lilac trees and hellebores, a dusky pink flower also known as the Lenten Rose. Nearby there's a four-square garden, with fairy roses surrounded by annuals like tulips and alyssum and — typical for Revolutionary War-era homes — herbs, with lady's mantle and chive among them, and Egyptian onions. BELLAMY-FERRIDAY HOUSE AND GARDEN 9 Main Street North, Bethlehem, Conn.; (203) 266-7596. Open May – October, Friday through Sunday, 11 a.m. to 4 p.m., plus Wednesdays, May – August. $4. ELIZABETH PARK ROSE GARDENS 915 Prospect Avenue, at Asylum Avenue, Hartford; (860) 231-9443, elizabethpark.org; Free. GLEBE HOUSE AND THE GERTRUDE JEKYLL GARDEN 49 Hollow Road, Woodbury, Conn. (203) 263-2855, theglebehouse.org; $5; $2 for ages 6 to 12; garden only, $2. HILL-STEAD MUSEUM AND GARDENS 35 Mountain Road, Farmington, Conn.; (860) 677-4787, hillstead.org; $10, $9 for 62+, $8 for students, $5 for ages 6 to 12, free for children under 6. WICKHAM PARK 1329 West Middle Turnpike, Manchester, Conn.; (860) 528-0856, wickhampark.org. $4 on weekdays; $5 on weekends and holidays.